Scott Majka swimming at the Mid Penn Conference Championship. This season Trinity graduate Samantha Shirtliff ‘14 took the helm of the Trinity High School Swimming & Diving team. A District III champion (2011 100 yard freestyle) and twelve-time PIAA Championship finalist in her own right, Coach Sam has really made an impact this season building the team. The Boys’ and Girls’ records this season, 9-2 and 8-3, respectively, are their best in three years. 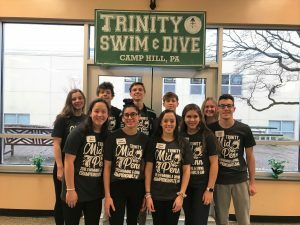 Since the 2011-12 season, Trinity High School has been in a cooperative swimming and diving program with Camp Hill High School (CHHS). Tommy Chase competing vs Mechanicsburg on January 8, 2019. 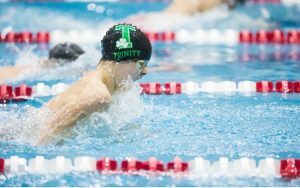 Select members of the Trinity Swimming & Diving Team recently competed at the 2019 National Catholic Swimming & Diving Championship held at Loyola University from January 19 and 20, 2019. Eight girls and seven boys competed during this preliminaries and finals format meet. 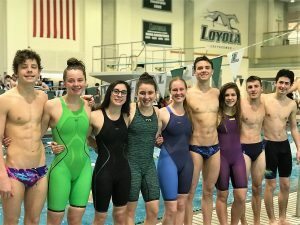 Catholic high schools from as far as Connecticut, Ohio, and Virginia travel to compete in this meet. After preliminaries, many of the teams attended 5:00 p.m. vigil Mass at the magnificent Cathedral of Mary Our Queen a short drive down Charles Street. 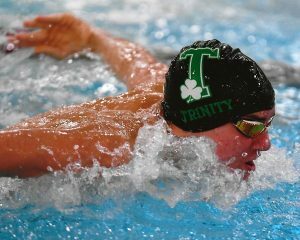 The prelim/finals format allowed several Shamrocks to return Sunday for another swim. The Girls 200 yard medley relay of Lila DiCarlo ’21 (CHHS), Nicole Lee ’19 (CHHS), Bramley Hawkins ’22 (CHHS), and Alexis Majka ’19 (Seton House) placed 11th. The Girls 200 yard freestyle relay of Lila DiCarlo, Apple Burton ’22 (Immaculata House), Bramley Hawkins, and Alexis Majka placed 8th. In the Girls 100 yard Butterfly, Apple Burton placed 15th and Lila DiCarlo placed 16th. Alexis Majka placed 11th in the 100 yard Freestyle. Apple Burton placed 7th in the 500 yard Freestyle. Lila DiCarlo placed 13th in the 100 yard Backstroke. The Boys 400 yard Freestyle relay of Tommy Chase ’20 (Immaculata House), Devon Savo ’22 (De La Salle House), John Zak ’19 (Seton House), and Scott Majka ’19 (Seton House) placed 15th. 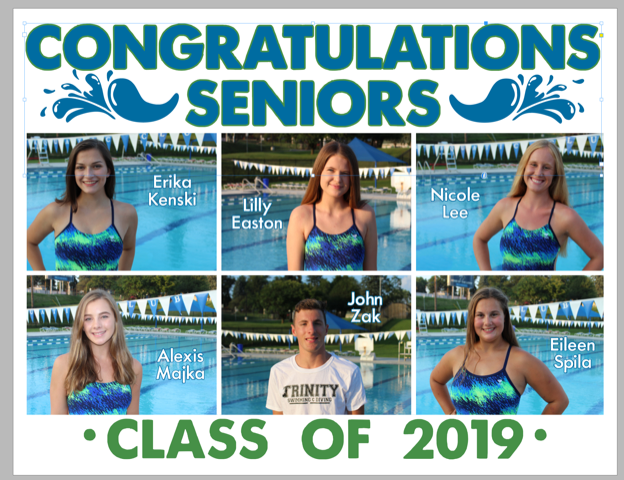 The team celebrated Senior Night at the Trinity versus James Buchanan Meet on January 22 at our new home pool and practice facility the Keystone Aquatic Center located in Carlisle. The seniors, Lilly Easton (Seton House), Erica Kenski (Seton House), Nicole Lee, Alexis Majka, Eileen Spila (De La Salle House), and John Zak walked through a tunnel of cheering teammates and assembled with their families on the center bulkhead. The team’s only fundraising event, the Pancake Breakfast was held on Saturday, January 26th in the Trinity cafeteria. The 15th Annual Pancake Breakfast is Trinity’s longest continuously running community event. All facets of the Trinity community descend on the cafeteria for delicious pancakes, breakfast meats, and drinks on a chilly January morning. During this event, the crowd is served by members of the team and is able to bid on several baskets as well as enter the continuous raffle that awards four to five gift cards every fifteen minutes. The fun is compounded by having a select guest raffle ticket picker. The team’s postseason meets include the Mid Penn Championships (February 8 and 9) and the Mid Penn Polar Plunge (February 15 and 16), which are the last opportunities to earn a slot to compete at the District III AA Championships held at Cumberland Valley High School on March 1 and 2. The season culminates at the Pennsylvania Interscholastic Athletic Association Championship meet held at Bucknell University on March 13 and 14.